The fake product is the result of a photoshopped image created by artist Adam Padilla and posted to his meme-creation Instagram account, @adam.the.creator. A meme advertising a fake Fisher Price Happy Hour Playset is causing internet viewers to do a double take. 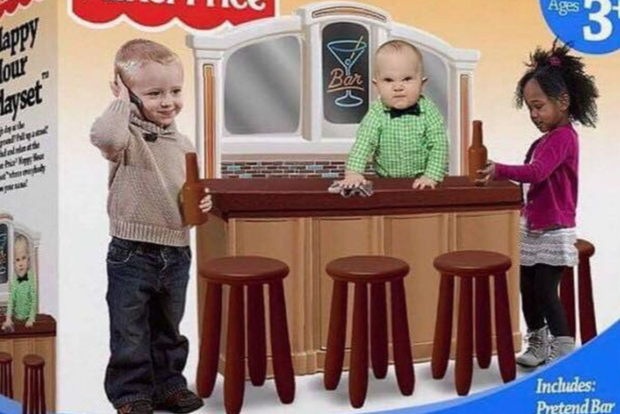 The photoshopped advertisement shows a plastic kid-sized Fisher Price bar playset complete with three bar stools and little plastic beer bottles marketed for children ages 3 and up. Fisher Price has been answering queries on the mock product on its social media page ever since the meme began circulating, with some confused viewers reaching out in anger before realizing the toy isn't real. Others, however, are finding humor in the mock ad by posting (let’s assume jokingly) that they wish the toy was real so they could buy it for their kids, as well as applauding the company for the handling of its brand crisis.